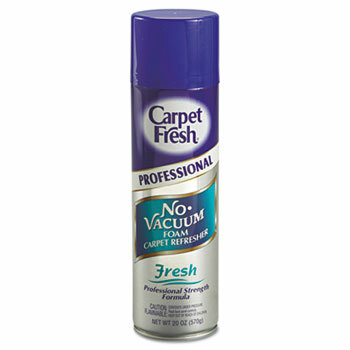 Carpet Fresh eliminates even the strongest clinging and lingering odors to clean and refresh entire rooms. Its patented foam formula and unique odor-fighting agents penetrate deep into fibers to neutralize pet, smoke, food, cooking and musty/stale odors. Safe to use on all washable fiber surfaces including: upholstery, pillows, drapes, luggage and curtains. Added neutralizers and long-lasting fresh scent. Simple to use, just spray it on. NO Vacuuming! Quick-drying foam disappears and dries under 5min. Use in public spaces, hotel rooms, offices, and automobiles.